Note: All parts within this series comply with the BAA's Country of Origin requirements with the exception of the Walkerduct support couplings, which are made in China. 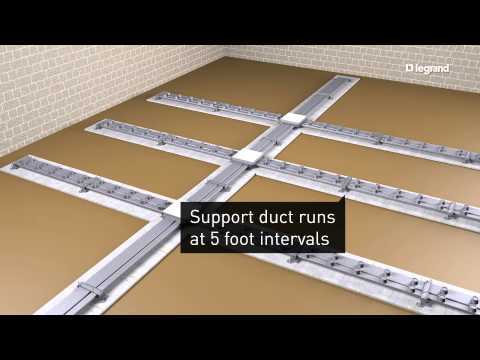 The Walkerduct system includes two sizes of underfloor ducts - No.2 and No. 4 - for maximum flexibility. This allows you to match cable capacity to project demands by combining several ducts of different sizes in the same system. Pro Series presets are rectangular to accommodate a large variety of service fittings, including flush options, while providing ample bend radius to ensure the integrity of fiber optic cable connections. IPS presets are round and offer smaller egress areas. These work with pedestal style activations. Ideal for furniture feed applications. Boxes can also be field-attached. These are called aftersets and are available in a range of depths. Compatible with 1200 Series, 525 Series, Multiplex Series, Pro Series, PSRC9 Series, and Source I Series service fittings. Walkerduct can be fed by junction boxes, or by Trenchduct for larger cable capacity installations. Explore the infloor system interactive tool to learn more.